It’s frustrating when you cannot find what you are looking for. Whether it is your keys or the ever-elusive appreciation letter from the company – searching for things is bound to waste your time. Therefore, it is imperative to stay organized. Fortunately, Pardot offers Folders and Tags to organize your contents in an easy to find structure. Oftentimes, the benefits of file and asset management are overlooked; however, keeping your content organized, and easy to find, will save you time. Not only will it save you time, it will also improve the workflow of your organization’s activities. When marketers on your team are looking for specific assets (email templates or landing pages) – to include in a new offer; or, your design staff is building out a new campaign – having folders that are easily navigable, enables marketers to complete their tasks effectively and efficiently. If you have applied proper tags to your marketing content, then you can use tags to filter data tables in Pardot. It is important to place your files into easily identifiable folders with a structure that makes sense to other users. It is also possible to share the folders with groups. Sharing folders will help you to not only protect your folders’ content; but, it will also enable you to assign appropriate access to user groups. In Pardot, you can use, global search, to search for a file across all folders without the need to look for a folder in which you originally placed the content. As your organization grows, and you need to quickly find a specific file, relying on global search is highly inefficient and ineffective. Therefore, before going ahead and creating folders in Pardot, it is important to discuss the folder structure. Getting organized always seems like such a chore. I am sure many of us can still hear the words of our parents similar to this – there is a place for everything, and everything should be in its place. Therefore, it is very important to organize your content in structured folders. By keeping in mind your marketing content categories, you can design a folder structure that increases productivity. 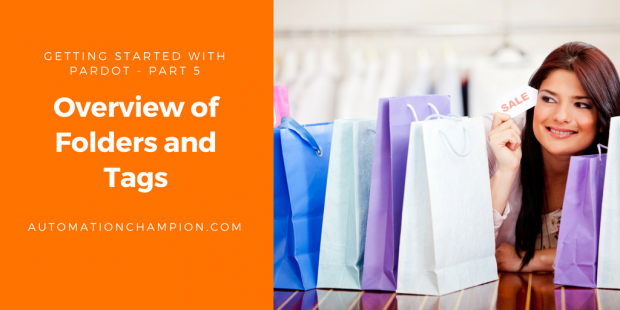 The first step you can take, in your folder management, is to use a pyramid structure and consider high-level categories that house all your subfolders. Depending on your organization’s needs, and size, you will need the different number of folder tiers. A common mistake in building out a folder structure is that, rather than starting out simple, users opt for too much granularity from the very beginning. I personally prefer to structure folders by fiscal years. Structuring folders by fiscal years make it easy to identify and archive marketing contents. Contents that are going to be used often, can be placed in an Ongoing folder, as shown in the following screenshot. Whenever you creates a new marketing asset you must choose a folder to store that content. You can store the following types of content in a folder – Automation Rules, Files, Custom Redirects, Campaigns, Layout Templates, Forms, Form Handlers, Emails, Landing Pages, Dynamic Content, Drip Programs, Multivariate Tests, Lists, and Email Templates. The preceding screenshot displays, how a marketing team member stores email template into a folder i.e. Email templates/2017. Creating folders, to house your marketing assets in Pardot, is a quick process; and, you can put the folders to use as soon as you create them. A folder has 1:1 relationship with marketing asset, it means one marketing asset can store only in one folder. Similar to folder sharing in Salesforce, in Pardot, you can protect your content in folders by sharing it with user groups. This feature is available to only those customers that have purchased Custom User Roles. –> It is not possible to rename or delete an Uncategorized folder. Let us say that, you want to share Form Handler folder, that we have just created, with a user group ‘ Mumbai‘. 3. From the Groups with Access drop-down, search for and select groups you would like to grant access to. Only those Groups, that will appear under Users with Access drop-down, whose has at least one member. –> Subfolders inherit permissions from parent folders. Similar to Favouriting report folders in Salesforce, a user in Pardot, with access to folders, can favorite up to 10 folders. Favouriting a folder enables a user to access it easily. Let us say that, you want to favorite Form Handler folder. Favorited folders can be accessed from almost anywhere in Pardot by navigating to Marketing | Folders and selecting a Form Handler favorite folder from the drop-down. You should begin to apply tags to your content as soon as you build or upload, contents in Pardot. The sooner you begin, the sooner you can start taking advantage of it. Tags are lightweight user-driven taxonomy. Tags are used in organizing, sorting, filtering data, and reporting. Every asset in Pardot can be tagged – with one or multiple keywords or phrases. A tag has 1:M relationship with marketing asset. It means that you can apply multiple tags to your marketing asset. Furthermore, Tags can be applied to most objects – Automation, Campaign, Drip Program, Email Template, Email Template Draft, File, Form, Landing Pages, Lists, Segmentation Rule, Form Handlers etc. Use Automation Rules to add or remove tags. You can also add, or remove, tags through a Completion Action on a Form, File, etc. You can also add tags to prospects while importing it. In my next blog, I will take a deeper dive by showing you how to create and manage the campaign in Pardot.